Amla is one of the oldest Indian fruits. It is a rich source of vitamin C and its content of ascorbic acid is next to only that of Barbados cherry (Malpighia glabra L.). It is one of the three constituents of the famous ayurvedic preparation, triphala, which is prescribed in many digestive disorders (Chopra et al. 1959). 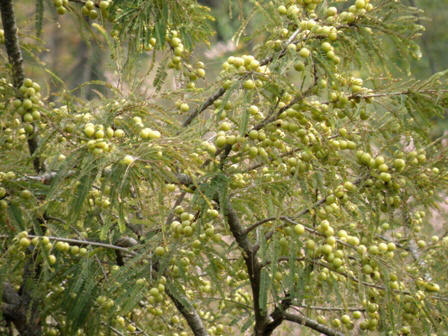 The medicinal properties of amla have been mentioned in old ayurvedic texts, such as Charaksamhita and Sushrutsamhita (Kirtikar and Basu, 1935). It is used in making pickles and preserves. The aonla preserve is one of the specialties of the Indian fruit-preservation industry. 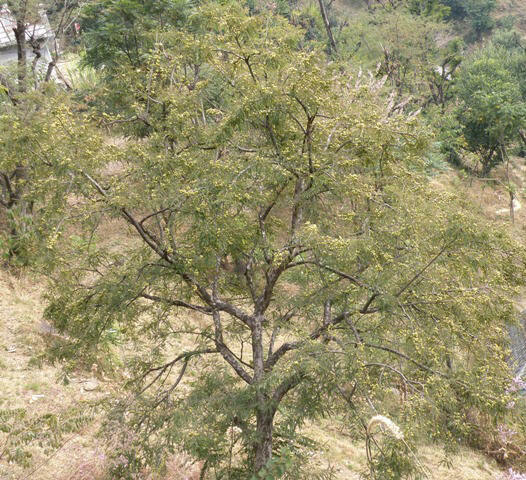 In Himachal Pradesh, the amla seedlings grow wild in the forests up to elevations of 1,450 metres. The major difference between these wild trees and the large-fruited types cultivated in the plains is of winter-hardiness. Whereas the improved types are highly susceptible to frost injury, the trees of wild amla are not damaged at all. 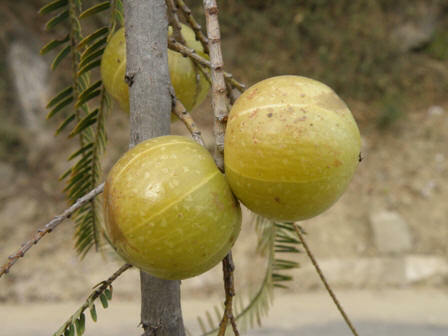 Amla is a heavy bearer and the fruits also remain free from the attack of birds and wild animals. This plant also remains free from any serious disease and major insect pest. A deciduous tree, small to medium in size, the average height being 5.5 metres; its bark is usually light brown to black, coming off in thin strips or flakes, exposing the fresh surface of a different colour underneath the older bark; the average girth of the main stem is 70 cm; in most cases, the main trunk is divided into 2 to 7 scaffolds very near the base. Leaves, 10 to 13 mm long, 3 mm wide, closely set in pinnate fashion, making the branches feathery in general appearance. The leaves develop after the fruit-set. Flowers, unisexual, pale green, 4 to 5 mm in length, borne in leaf-axils in clusters of 6 to 10; staminate flowers, tubular at the base, having a very small stalk, gamosepalous, having 6 lobes at the top; stamens 1 to 3, polyandrous, filaments 2 mm long; pistillate flowers, fewer, having a gamopetalous corolla arid a two-branched style; both staminate and pistillate flowers are borne on the same branch, but the staminate flowers occur towards the apices of small branches. Fruits, fleshy, almost depressed to globose. 2.14 cm. in diameter, 5.68 g in weight, 4.92 ml in volume, primrose yellow 601/2. The stone of the fruit, six-ribbed, splitting into three segments, each containing usually two seeds; seeds 4-5 mm long, 2 to 3 mm wide, each weighing 572 mg, 590 microlitres in volume, citron green 793/3. Amla is a deciduous tree and the emergence of new shoots starts in the beginning of April. The shoots are light red and turn green after 2 or 3 days. After about 15 days, the small lateral twigs, which are 3-3.5 cm long, give out two rows of leaves on each side. They have the appearance of compound leaves, with about one hundred leaflets on each. Small circular green flowers also appear in the axils of these small leaves at the same time. The flowering season was observed to occur from the middle of April to the first week of May under Sanwara (H.P.) conditions. The flowering reached its peak in the end of April. The fruiting season of aonla is exceptionally long. The fruit in this area become fit for harvesting in December. They can be retained on the tree up to March without any significant loss in quality or yield. The picking of fruits is generally done by the villagers in February and March. The average yield of wild aonla-trees growing in the forests is 23.5 kg. The fruit pulp, which constitutes 90.97 per cent of the whole fruit, contains 70.5 per cent moisture. The total soluble solids constitute 23.8 per cent of the juice. The acidity of aonla is 3.28 per cent on pulp basis. The pulp contains 5.09 percent total sugars and 5.08 per cent reducing sugars. The ascorbic acid content is 1,094.53 mg per 100 ml of juice. The tannins and pectin content of the pulp is 2.73 per cent and 0.59 per cent respectively. The medicinal properties of Emblica officinalis Gaertn. have been mentioned by many authors (Watt, 1892; Kirtikar and Basu, 1935; Burkill, 1935; Chopra et al, 1959; Dastur, 1962; Rao and Siddiqui, 1964; Jain 1968; Khanna and Bansal, 1975). The fruits are diuretic and laxative. They are useful in the disorders associated with the digestive system and are also prescribed in the treatment of jaundice and coughs. Amla is one of the three ingredients of the famous ayurvedic preparation, triphala, which is given to treat chronic dysentery, bilousness and other disorders. 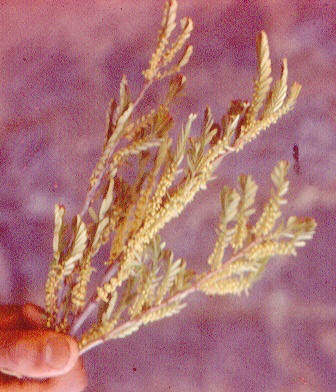 The plant is considered to be an effective antiseptic for cleaning wounds and it is also one of the many plant palliatives for snakebite and scorpion-stinging. The leaves of aonla are used as a mouth wash and as a lotion for sore eyes. An ointment is made from the burnt seeds, and the oil obtained is applied to cure skin infections. The fruits are very acidic and astringent and therefore they are not very suitable for consuming in the fresh condition. The ripe fruits, when eaten fresh. taste highly acidic, but when water is drunk after eating them, the taste of mouth turns sweet. The aonla-fruits are not good for fresh consumption because of astringency and acidic taste. These fruits are used in huge quantities for making pickles and preserves, both in the villages and in the towns. They are offered for sale in the towns for this purpose. The aonla-fruits are dried for making triphala. They are also used as a principal ingredient in making another famous ayurvedic tonic, chyavanprash. The fruits and the bark, are rich in tannins and are used for tanning leather by the tanners in the villages. As mentioned earlier, the wild amla is highly resistant to frost. The improved types cultivated in the plains lack this quality. The wild aonla can be used as one of the parents in hybridization program with a view to evolving frost resistant varieties. The aonla plant is quite ornamental because of its leaves the tree looks more attractive when laden with fruits. Since the wild aonla is a hardy plant, so it can be planted as an avenue plant in the low hills.